Live results will be available over the weekend of the gala. The pool will be closed on Friday 19th April and Monday 22nd April. Swimming on Easter Sunday is on as normal. Swimmers in C1 are able to come in on Sunday from 5-6pm as there is no swimming on Monday. 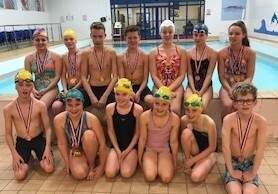 Absolutely fantastic results this weekend for the Sedgefield 75 swimmers, as they took to the pool at Billingham for the ‘Off the Blocks’ gala hosted by Richmond Dales ASC. 12 swimmers competed in a total of 53 swims, bringing home 46 medals and an outstanding 43 Personal Best times. These totals do speak for themselves as every single swimmer brought home at least one medal AND a personal best time, which shows how much hard work they have put into their training. Tynemouth gala, bringing home a Gold medal. Thank you to all parents and swimmers who supported out bag pack at Tesco, Newton Aycliffe. The club has raised just over £800 from this fundraising effort. Volunteers wanted to help at a bag pack at Tesco, Newton Aycliffe, Sunday 24th March. Please speak to Emma, Julie, Ann if you can spare an hour to help with this fundraising initiative. Congratualations to all of our swimmers who qualified for the Northumberland and Durham Championships. The championships were held over 3 weekends. For Katelyn and James it was their first opportunity to swim in the magnificant Ponds Forge 50m pool. The age group championships were held at the Sunderland Aquatic Centre, all swimmers made finals, which was a magnificent achievement. Emma came away as Northumberland adn Durham Champion in the 200m freestyle, and she won a host of medals in her other events. Following the AGM meeting, we have decided, despite an increase from Swim England, that our annual membership fees will remain the same for 2019. A,B and C2 and C3 this will be £75, for C1 the fee will be £30. The membership fee includes ASA, NER and N&D affiliation fees. Membership fees need to be paid by Monday 25th February, to allow us to get the fees paid by the end of February. This can be paid by BACS as a one off payment or in cash on a Monday night. Please speak to Ann or Malcolm if you have any questions about the payments. Please can you increase your direct debits as soon as possible. Training for A Squad will be from 5-6pm on Sunday as the other coaches are at the Darlington Dander Meet. Saturday 1st Sept 6:45 to 8:45 NALC A Squad and B Squad AM. Saturday 8th Sept. 7:00 to 8:30 Woodhouse Close A Squad AM. The club will return after the summer break earlier than originally planned. Sessions will resume for all squads, at their usual times from Tuesday 28th August, this is du to a pool closure, which we have just been made aware of, which will commence from Monday 3rd September. The closure is expected to last for one week and we will confirm once we know when training can commence. We are seeking alternative times/locations to train but at the minute we don't have anything confirmed. Good luck to Leah, who will be competing tomorrow at the Swim England Summer Nationals in Sheffield. Leah will be competing in the 50m breaststroke. Good luck to Niall, who will be competing this week at the British Summer Championsips in Sheffied. Niall will be competing in the 100, 200 and 400 freestyle events. Watch the swimming live from Sheffield here. Thank you to everyone who supported the club at our sponsored swim we raised a total of £1800 which will be split equally between St Teresa's, Cancer Research and the Club. The charities will be presented with their cheques on Monday 30th July at 7pm. A reminder to all parents that from 1st August until the 1st September the club will only train on a Monday evening, this is to give the swimmers, parents and coaches a well earned break. Remember to get your club gala forms in to your coach. Closing date is Monday 18th June. We need parents to support the club on the night. Please sign up on the sheet, which is on the club notice board. The pool will be closed on Monday 28th May as the leisure centre is closed because it is a Bank Holiday. Just a reminder to any parents, of swimmers in C1 and C3, if you haven't paid your annual membership please can you speak to Ann Hunter asap. Any swimmer who has recently moved squads please can you amend your standing order as soon as possilble. There is no training tonight as the leisure centre is closing at 3pm. Please phone the leisure centre tomorrow if you are unsure if swimming will be on. This gala is now full - no more entries will be accepted. Northumberland and Durham are running a level 1 judge course at Stanley on 21st February 2018. Officials are needed to ensure the smooth running of galas. Information about the course is available here. John Moore and Ean Parsons are teaming up to provide a unique session to local clubs and athletes where they will explain their approaches and offer an opportunity to discuss the challenges of swimming, running and competing. John has been coahcing at Sedegfield 75 since the early 80's and Ean has been a coach with Sedgefield Harriers for 12 years. The Northumberland and Durham County Championships were held at the Sunderland Aquatic Centre over two weekends 3/4th Feb and 10/11th February Representing Sedgefield 75 ASC were Niall Coulthard, Kyle Boyak, Katelyn Craig, Leah Smith and Emma Price. They competed in 28 events and took part in 21 finals. The medal tally was 2 Gold, 3 Silver and 4 Bronze. Niall won Gold in both the 400 and 200 Freestyle events and took the silver medal in the 100 Freestyle and was placed 5th in the 50. He took the Bronze medal in both the 200 and 100 Butterfly. He was 6th in the 50 Back and 10th in 200 Breaststroke. 15 year age group. An outstanding performance from a great athlete. Kyle had only one swim taking the Bronze Medal in the 100 Freestyle. A good performance after a long lay off when he was not able to train. Emma was another swimmer competing in her first N&D Championship. She was 4th in the 100 Freestyle. Was placed 7th in the 50 Breaststroke and 9th in the 100 Breaststroke. Taking 6th place in the 100 Backstroke. She competed in the 200 Individual Medley and the 200 Freestyle and the 50 Butterfly and backstroke. Congratulations to all the swimmers. You did the club and yourselves proud. Just a reminder that membership fees are now due. Please make your payment to Ann by the end of February. Following the AGM meeting, on Thursday 14th December, we have decided, despite an increase from Swim England, that our annual membership fees will remain the same for 2018. A,B and C3 this will be £75, for C1 the fee will be £30. The membership fee includes ASA, NER and N&D affiliation fees. Membership fees need to by paid by Monday 19th February, to allow us to get the fees paid by the end of February. This can be paid by BACS as a one off payment or in cash on a Monday night. Please speak to Ann or Malcolm if you have any questions about the payments. Please can you increase your direct debits ready for the January payment. Chief Coach, John Moore was crowned as overall winner of the Northern Echo Local Heroes Award at the awards ceremony which was held at Wynyard Hall last night. John also won the Sir Bobby Robson Leading Light Award, which meant he was also eligible for the Local Heroes Award. John was lost for words when he found out he had won. John was at the ceremony along with the other coaches from the club. This has addaed to an eventful few months for John, he had a surprise 80th birthday party at the club and then he was presented with the Gray Award for his services to swimming. Chief Coach, John Moore has been shortlisted for the Sir Bobby Robson Leading Light Award at the annual Northern Echo Local Heroes Awards. He will be attending the Awards Dinner, at Wynyard Hall, on Thurday 8th December along with other coaches from the club. Good luck John, this is fantastic end to a memorable year for you. Twelve swimmers from the club travelled to Eston to compete in the Northallerton Winter Sprints Gala on Sunday 3rd December. The club came away from the gala with a haul of 40 medals - 18 gold, 16 silver and 6 bronze. Emma Price has added to her N and D Qualifying swims with the 200m freestyle, she also won medals in every event she competed in. Kathryn Lee, Chloe Harding, Mateusz Wilczynski, Matthew Wimbury and Katelyn Craig also won medals in all of their events. Medals were also won by James Hodgson, Jake Andrews, Charlie McEwan and Nell Heslop and Zoe Hodgson swam personal bests during the meet. Training will be cancelled on Thursday 7th December for all squads and Friday 8th December (morning session). The coaches will be attending the Local Heroes Award Ceremony at Wynyard Hall on Thurday night to celebrate John being shortlisted for the Bobby Robson Leading Light Award for his contribution to swimming. 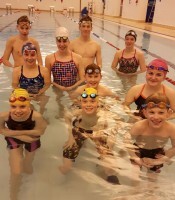 Sedgefield 75 sent 12 swimmers to the Wear Valley gala, 11/12th November. For Charles Mc Ewan and Liam Hughes it was the first taste of competitive swimming and they both exceeded their entry times. The club won a total of 15 medals - 9 gold, 2 silver and 4 bronze. Medals were won by Ethan Craig in the 50 fly - 3rd, 200 back - 1st, Matthew Wimbury 50 free - 2nd, 50 breast and 100im 3rd, Niall Coulthard 50 breast, 200 breast, 50 back 1st, 100 breast 2nd, Katelyn Craig 200 butterfly 1st, 50 breast 3rd and Leah Smith 100 back, 200im and 200 breast all gold medals. Well done to everyone who competed. Lots of PB's from everyone. Leah Smith was the only swimmer representing Sedgefield 75 at the North Eastern Region Junior Championships held at the Sunderland Aquatic Centre on the 28th and 29th October. She competed in eight events over the weekend. Leah won silver in the 50 Breaststroke and bronze in the 100 Individual Medley. She was placed 8th in the 200 Breaststroke and 10th in the 100 Breaststroke. At the North East Regional Age Group Championships, John Moore, chief coach at Sedgefield 75 was awarded with the Northumberland and Durham’s prestigious Gray in recognition for all he has done for aquatics within the county. 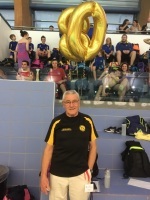 He also celebrated his 80th birthday and on Monday evening, the club held a surprise birthday party for him which was attended by coaches and swimmers from past and present. John Moore has been an active member of the aquatics community within Northumberland and Durham for the past 40 years. During that time he has coached in clubs throughout County Durham including Durham, Darlington and Sedgefield, where he has been coaching since 1982. John has extensive experience and knowledge of the sport and is well respected within the county and region. He has been the head coach on county and regional teams and has coached 7 international swimmers and one Commonwealth Games finalist. Good luck to Leah Smith, who will be competing at the ASANER Age Group short course Championships at the Sunderland Aquatic Centre. Good luck to Matthew Bradley, who will be competing in the Swim England Short Course Masters competition, which is being held at Ponds Forge, Sheffield. After the first day of competition Matthew has already won gold in the 18-24 years 200m freestyle. Niall Coulthard was competing at the English Schools Biathlon Championships which took place at Hexham. He won his age group competition and has now progressed to the National finals. Sedgefield 75 took 16 swimmers to compete in the first gala of the new swimming year at Darlington. For Nell Heslop, Lucy Heron and Emma Price it was their first taste of competing in a gala. Everyone swam exceptionally well and the swimmers came away with lots of new personal best times. The club won a total of 14 Gold, 4 Silver and 7 Bronze medals, which is a fantastic result for the first gala of the year. Matthew Wimbury took Gold in the 50 FS. Silver in the50 Breast stroke and Bronze in the 100 FS. George Wilkinson took silver in the 100 Breast. Ethan Craig gained Bronze in the 50 Back. Chloe Harding gained Bronze in the 50 FS, the 50 Fly and the 100 Back. Following discussions with Newton Aycliffe Leisure Centre I am pleased to let you know that normal training will commence on Tuesday 29th August. Niall (14) and Leah (13) will be competing at the Swim England Summer Meet which will take part at Ponds Forge from 2nd - 6th August. Both swimmers will be competing in the 13/14 age group. You will be able to follow the swimming results live here from the 2nd. Follow our swimmers, Hannah and Niall, live from the British Summer Championships, which is taking part this week at Ponds Forge, Sheffield. Just a reminder to all swimmers of the reduced sessions over the summer. The club only train on a Monday night from the 1st August until the 1st September, when normal training will resume.